This problem is based on the game Square It, which you can find in Seeing Squares. Players take it in turns to click on a dot on the interactive grid. The first player's dots will be blue and the second player's (or computer's) will be red. 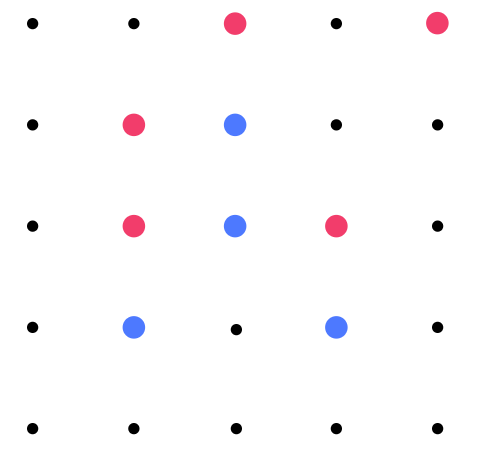 The winner is the first to have four dots of their own colour that can be joined by straight lines to form a square. Have a go at playing the game a few times against the computer to get a feel for it. Here is a picture taken part-way through a game. It is blue's turn next. Where would you go if you were the blue player? Click on the 'Show' button below to see which dot the blue player chose. Why do you think the blue player made that move? Compound transformations. Squares. Generalising. Visualising. Interactivities. Practical Activity. Games. Tangram. Working systematically. Cubes & cuboids.